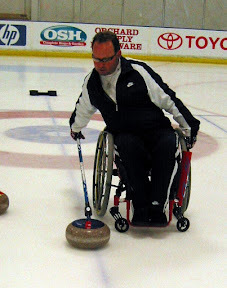 Wheelchair curling is a rapidly developing sport in the US and there are many opportunities to play socially and competitively. 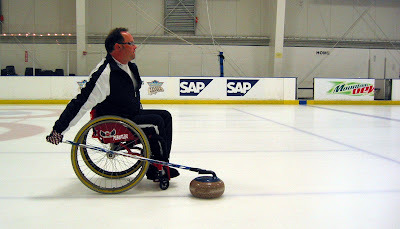 Although dedicated wheelchair curling leagues do have some different conventions (for example, no sweeping,) wheelchair curlers can play in any club league without a problem. 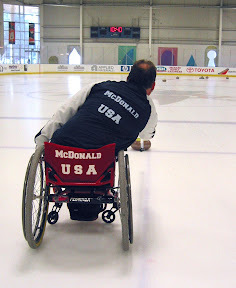 A local athlete, Patrick McDonald, who began curling in 2007, has played on the 2008 and 2009 US National Team and has competed at the 2010 and 2014 Paralympic games. He demonstrates his delivery technique in the photos below. Delivery style varies a lot from athlete to athlete depending on grip and torso strength and other factors, and our instructors can help you find something that will work for you. Looking for information about our upcoming wheelchair curling clinic? 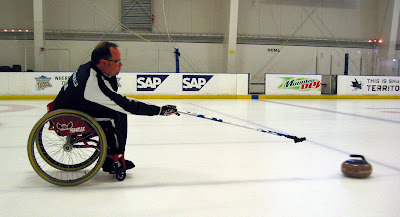 Visit bayareacurling.com/wheelchair-clinic.